I love challenges and the best part of food challenges is to learn along with other fellow food bloggers like curious as like me, i have been participating since i started blogging with a couple of food challenges happening in this virtual world and one of the recent food challenge is this International Food Challenge , a monthly event started by two wonderful food bloggers. Seriously i love this Internation food challenge, its a wonderful platform to learn various cuisine which is not that much familiar for many of us. Thanks to Sara and Shobana, the brain childs of this event for inviting me to this food challenge. This month's challenge is Cantonese cuisine,well this cuisine is one of the main cuisine in China. Their basic cooking techniques include roasting,stir frying,sauting,deep-frying,braising,stewing and steaming. Since am living in China town here, i know how wonderful and quick this cuisine is. Have you ever tasted their cantonese fried rice with chicken,prawns and eggs together, my kid will go crazy for this rice. Am an ardent fan of their cuisine and i got an immense chance to make their spiral moon cake which is quite famous during Chinese new year.I have tasted this moon cake before few years and its was a mystery for me , seriously i wondered how this cake is prepared, but finally i able to make some moon cake at home through this challenge. The store bought moon cake and this homemade moon cake doesnt have that much difference apart from the mould the stored one goes for and they tastes much more delicious after a day.Yes its hard to stop just with one. Cant believe,i have been blogging for a long yes today is 5years of blogging.. Happy birthday to my blog baby,am very much proud of my space and this virtual baby brought me so many beautiful moments in my life.My space earned me many awards,many appreciations,many friends, many gifts and more. I dont have words to say how i love my space and i cant sit idle without feeding my blog baby. This virtual world teached me so many lessons,i stopped running behind eggs, started experimenting with organic grains, finally i have became an Healthnut and am proud to be. For the celebration, am sharing today an eggless choux, a famous french pastry and a delicious eggless gelatin free chocolate mousse. Choux is a french pastry which goes for egg and for me without egg i cant imagine making this cute chouxs, but trust me Baking Eggless, owned by Gayathri taught me how to make choux without eggs, seriously am loving this baking group and we are learning the alternatives and subsitutes of eggs. As i told earlier, now am not running behind eggs,yep i learned how to make both eggless and vegan bakes through this immense virtual world. Coming to this choux, this choux are easily available here in bakeries and its one of our family favourite. Usually choux are filled with whipped cream while eclairs the elder sister of this choux is filled with various filling, they are oblong shaped pastries and my favourite eclair is coffee flavoured one. For the first time in my life i tried making this famous french pastry choux without eggs and replaced the eggs with flax seed powder and baking powder. Actually i have to serve the choux filled with the mousse but since i went for small choux, i served the mousse along instead of filling the choux. However we loved it thoroughly and i baked these eggless choux twice. Eggless chocolate mousse goes for an no gelatin mousse, its a quick and very addictive eggless mousse to enjoy thoroughly with any pastry, it will be very light,airy and very chocolatey.Thanks to Shey of Just Not the Cakes for pulling us to make this fantastic challenge. Cantaloupe is a summer fruit and its a peak season here until september, they cost very cheaper during summer, we never forget to get them from the nearby farmer's market.We love this super flesh fruits as salads,juices or as icecreams. Its hot here, when its too hot the first thing that comes immediately to our mind is to enjoy chilled fresh fruit or vegetable juices. 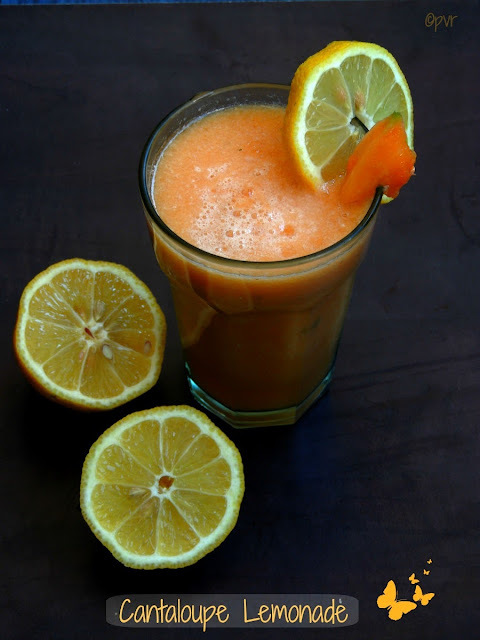 Here comes a quick,refreshing and simple healthy lemonade with fresh cantaloupe chunks and lemon juice.This A prefect drink to enjoy without any guilt while its super hot outside. With loads of ice cubes, this lemonade will definitely satisfy you, a fabulous thirsty quencher too.Today is the last thursday of the month and its time to post for Vegan Thursdays, an vegan event running twice a month.Sending to Pari's Only Food for Pregnancy. My daughter loves kheer with sago,vermicelli or else with pasta. For today's Krishna Jayanthi celebration, i prepared this vegan kheer with small shell pasta, jaggery and coconut milk. 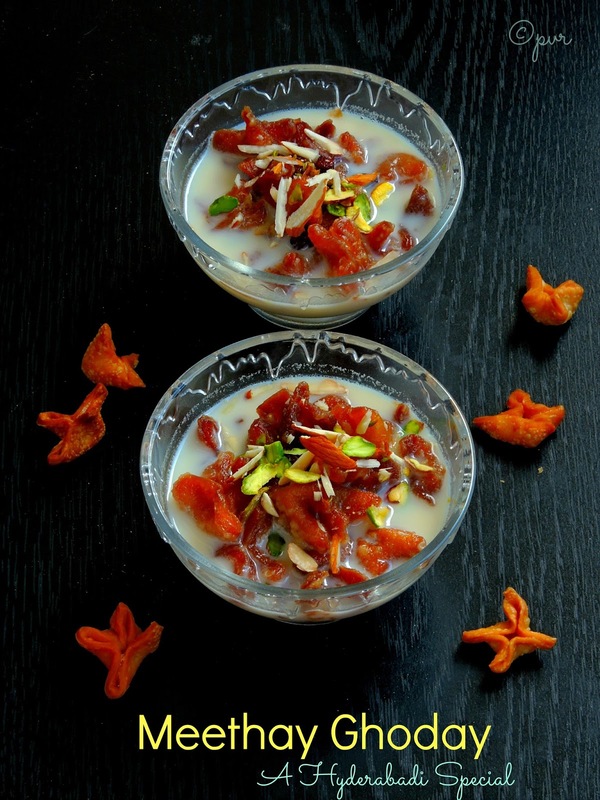 This kheer tastes simply fantabulous, with a wonderful coconut flavour. Look at the colour of the kheer, dont you love it. My daughter enjoyed thoroughly her bowl of this delicious kheer and with masala vada, needless to say how filling and delicious this kheer will be. 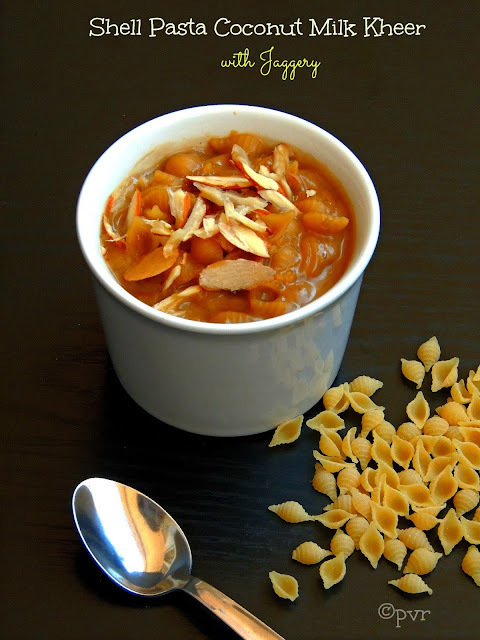 Since i used small shell pasta, they gets cooked very quickly and your kheer will get ready within less than 15 minutes, if you dont have pasta dont worry,you can still make this kheer with sago,vermicelli or with rice flakes.Just mix and match, am sure you will enjoy thoroughly this kheer.Storebought coconut milk works wonder in this kheer, but you can use very well the freshly squeezed coconut milk too. Tomorrow is Krishna Jayanthi, hope all are getting ready for the celebration. Even am making few simple sweets and savouries for this festival.If you dont have any time or busy with other stuffs but still you want to make sweets for the celebration you can make this easy,quick,delicious and healthy laddoos with red rice flakes. This sweet takes hardly less than 10 minutes to get ready, actually you can make them with white rice flakes, since am an healthnut i used organic red rice flakes which my mom got me from India before few months back. 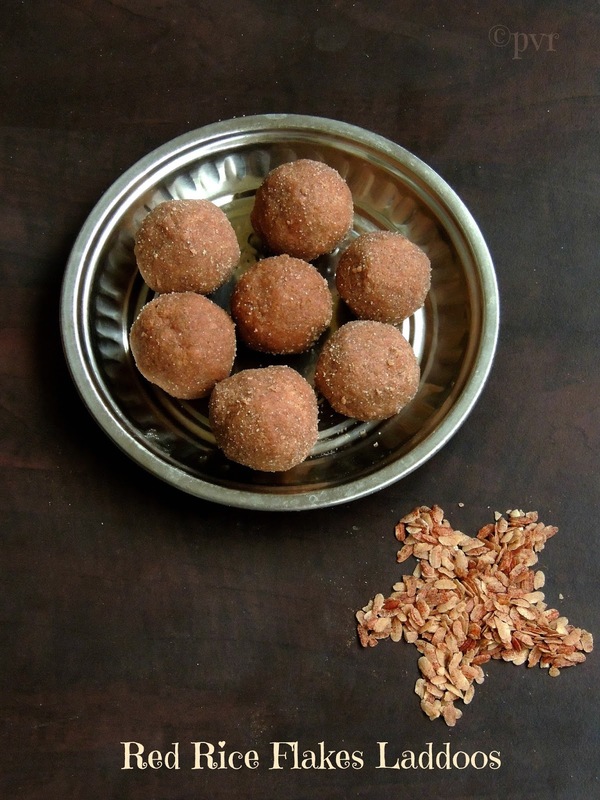 Also i prepared this laddoos completely with ghee and they were just mindblowing, if you dont like or dont want to use ghee you can use milk to make this balls. 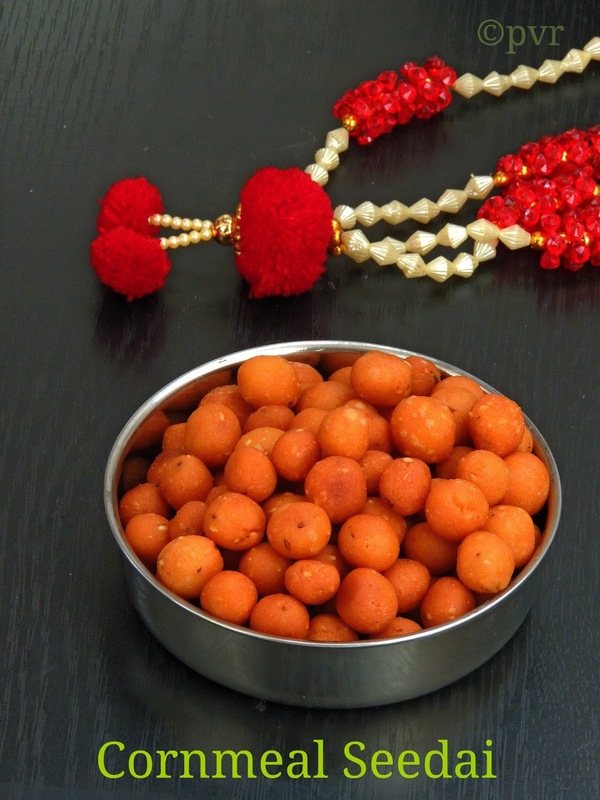 Seriously i love this kind of easy breezy sweets for celebrations and if you conserve them well in an air tightened box, they can stay prefect for more than three days. Dry roast thick red rice poha for a while. Grind finely the sugar with cardamom,keep aside. Now grind finely the roasted poha,add everything in a bowl and mix everything well. Heat the ghee in a pan add the cashew pieces, fry them until they turns brown and add it to the poha mixture. Add little by little the hot ghee to the poha-sugar mixture, roll them as balls. Store them in air tightened box. Friends are hard to find.In a Lifetime you get only a few. Friends means a lot for me, i always says that we cant chose our parents, but we chose our friends. I miss my schoolmates very much but thanks to this virtual world, some of them are now connected again to me through social networks. Life is getting more and more beautiful since few months, yep i got a decent bunch of blogger friends to whom i can share my joyful moments and sorrows, i know very well that they can stay besides me when am down and they will be very happy whenever i share my happy moments with them.One among those friend aka my younger sister is Manjula of Desi Fiesta,she celebrates her birthday today and we (few of my friends) joining her virtually to celebrate her birthday as we guys lives far away from her,yes we do live in an another continent, but the friendship bond between us is getting more stronger and stronger eventhough many miles separates us. Manjula a funny and fantastic person, i came to know more about her few months back, she was one of my follower and one of my co blogger who participates in many challenges and events, this is how she was in my mind before few months.But now i have an important place in my heart for her, after talking to her i came to know that she started her blog after going through mine, she says am her inspiration,watelse a blogger need na. Happy Birthday Manjula,may god gives your more health,happiness and many more beautiful things, you mean a lot for me and i'll definitely treasure your friendship. To celebrate Manju's birthday today with her virtually, we planned to make a thali as she challenged us A Rajasthani Thali for SN Challenge, since we love her enthu for cooking an elaborate thali, we planned to make almost a spicy South Indian thali. Manju, here is my Lunch thali for you with favourite fruit apple in a new avatar with nutella as shake. 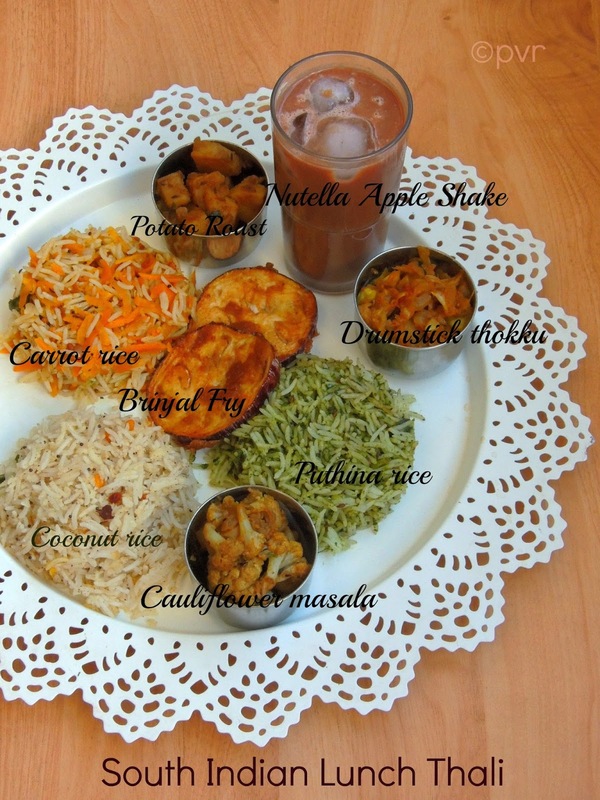 Hope you will enjoy my spicy delicious South Indian lunch thali. 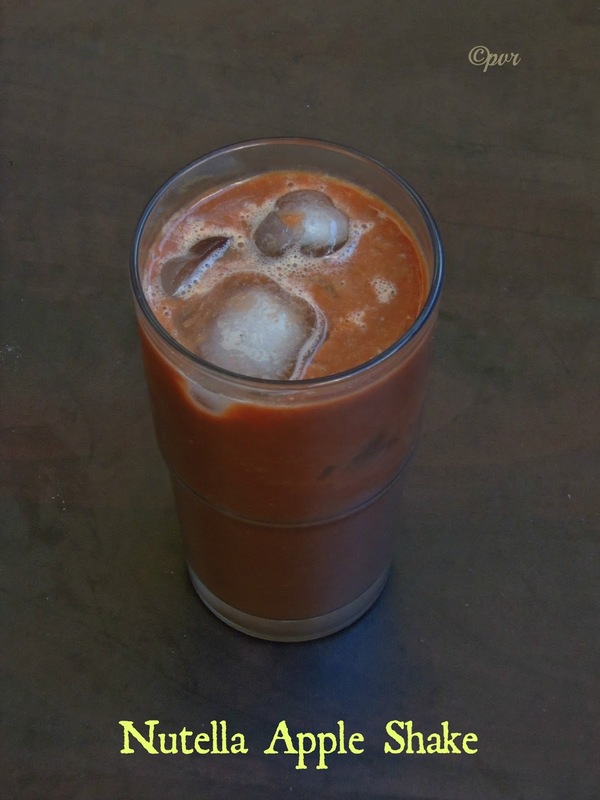 Take the chopped red apples,nutella,vanilla ice cream and milk in a blender,blend everything well. 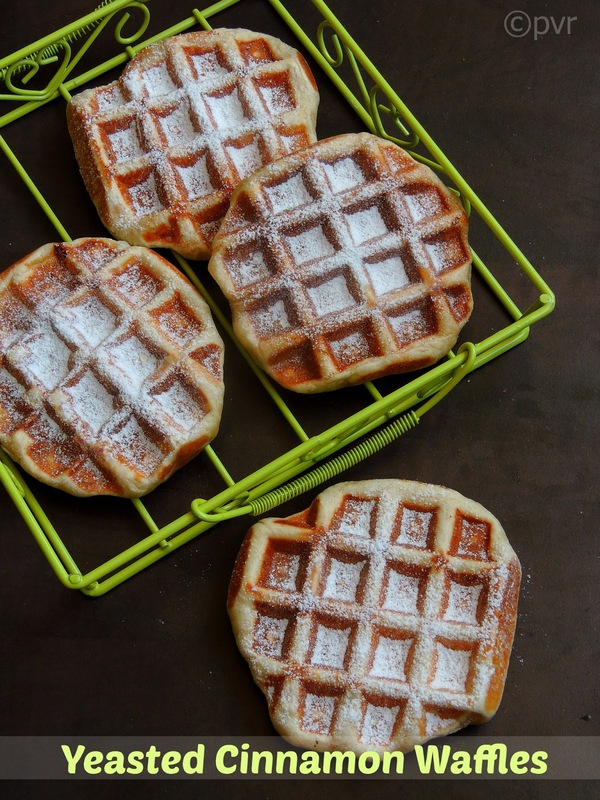 Waffle is a leavened batter or dough cooked between two plates, there are many variations based of the iron used for waffles and the recipe used for. Waffles makes an excellent snacks for kids and mine loves them very much with their favourite spread Nutella, whenever we go around Paris my kids wont come back home without waffles or French crepes, it was a routine for us until i got the waffle iron. Now i make them often at home both as yeasted one or with baking powder similar like American waffles. Usually waffles dont have any flavour apart from vanilla essence, while making mine this time,i just tried adding cinnamon powder just by curiousity and trust me the addition of cinnamon powder makes the difference. If you like cinnamon in waffles, this is one for you.An excellent snack for school going kids eventhough you can enjoy these aromatic waffles for breakfast with your cup of coffee or tea.Check out the Blogging Marathon page for the other Blogging Marathoners doing BM#31. Broccoli is one the most hated vegetable in my home before few years, but now its one of our most favourite vegetable. Recently i tried my hands in making a fantastic starter aka snacks with this antioxydant rich vegetable, yes i tried kola urundai with broccoli florets. Usually kola urundais are prepared with minced meats, but somehow we do make kola urundais with veggies like raw banana,banana blossom. 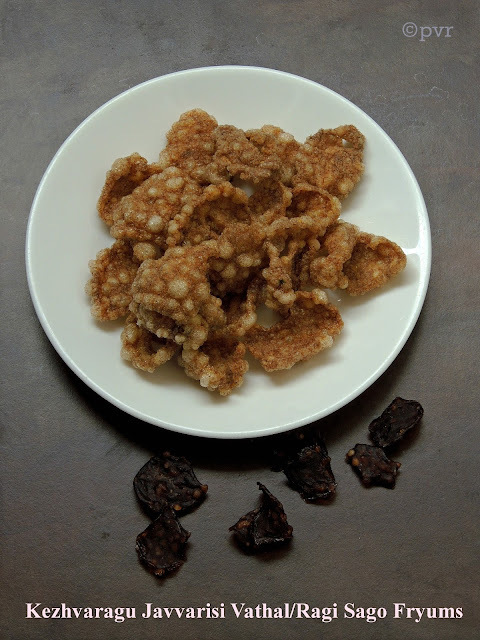 Since i chosed this week's blogging marathon with after school bites as theme, am posting this healthy, addictive and very crispy snacks. 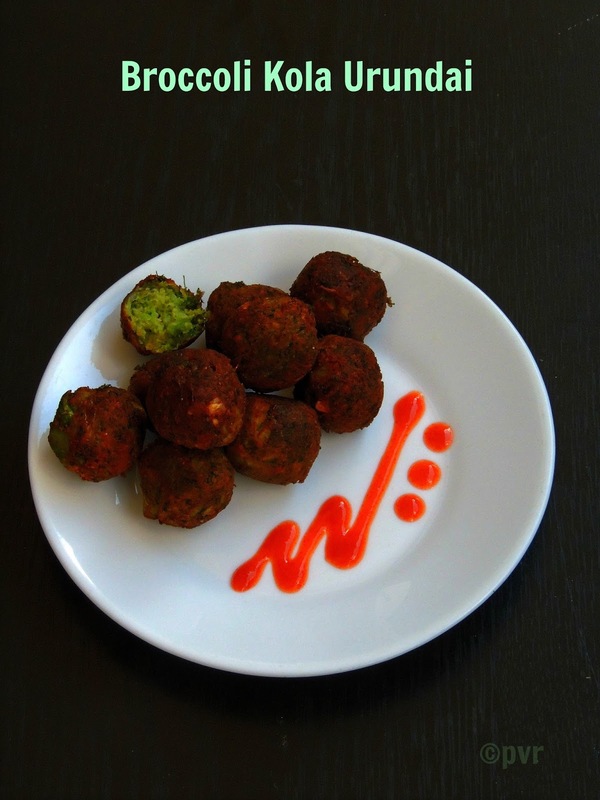 You can serve very well this broccoli kola urundais for any occasions,these balls are definitely a crowd pleaser and quite easy to feed anyone with this veggie. Personally making kola urundais with broccoli is one of the best way to sneak this healthy vegetable and its a kid's friendly dish. Once you finished frying these balls, just serve your kids and see how fast these crispy balls will gets vanish. Am sure this kola urundai will become a family favourite if you prepared them at home. Check out the Blogging Marathon page for the other Blogging Marathoners doing BM#31. 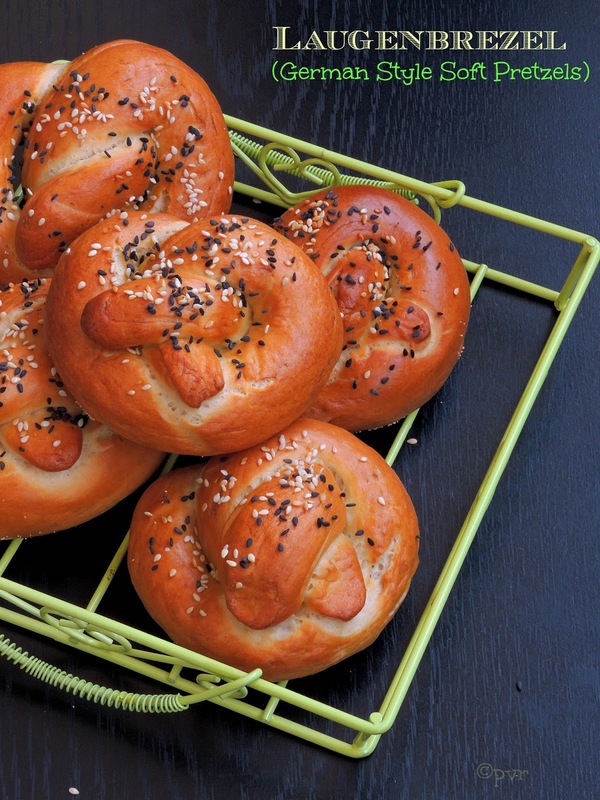 As per wiki,A pretzel is a type of baked bread made from dough most commonly found in a unique knot-like shape. Pretzels originated in Europe,the traditional pretzel shape is a distinctive symmetrical looped form, with the ends of a long strip of dough intertwined then, twisted back into itself in a certain way.Pretzels are often seasoned and flavoured with various salts,sugars or seeds or with nuts.For this month's We Knead To Bake, Aparna chosed both soft and hard pretzels, pretzels are in my to do list since a long and seriously i was longing to do them at home since we tasted them during our visit to Strasbourg. I chosed to baked Aparna's Soft Pretzels, this authentic German pretzel aka Laugenbrezel has a dark brown, crispy,salty crust and inside a soft dough. Its has a plump body and thin crispy but not dry crossed arms while the hard or crunchy pretzels are an American invention.Usually Pretzels goes an egg wash after the soda bath, to give them more shine, but i left the egg wash here and sprinkled the sesame seeds. These pretzels are egg free,if dont have or dont like sesame seeds you also sprinkle sea salt as like the authentic pretzels. Am running my fourth week of blogging marathon with Kid's delight-After school bites, and pretzels suits incredible prefect for evening snacks when served with a cream cheese,my kids enjoyed thoroughly these soft pretzels. Check out the Blogging Marathon page for the other Blogging Marathoners doing BM#31.. Sending to Bake fest hosted by Manjula,event by Vardhini. Krishna Jayanthi is around the corner, am sure many of us will be planning many sweets and savouries for the celebration. I love this festival very much and missing the fun we usually go through during festivals in India. But however i'll try to celebrate these festivals in simple way coz most of the time its working day here.If you want to try out different crispy uppu seedais for Krishna Jayanthi celebration, you have to give a trial to this crunchy munchy cornmeal uppu seedai..Usually we used to make seedais with rice flour and urad dal, here in this savoury seedai you can very well skip the urad dal completely and cornmeal will give a fabulous crunchy texture to this seedais, definitely an incredible twist to our usual seedais. My followers knows very well that i do prepare sprouts at home quite often and i'll cook them atleast once a week since sprouts are extremely nutritious and healthy also its recommanded to take them quite often if possible. 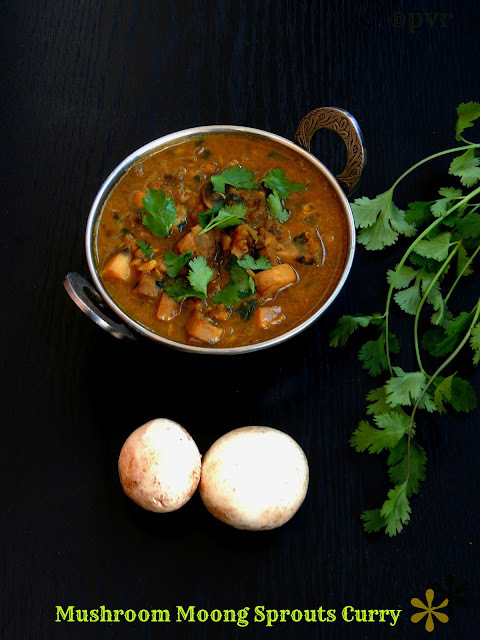 If i forget to prepare them at home i'll get atleast sprouts from organic shops and make food with them.Recently i tried this curry with button mushroom and homemade moong sprouts for our dinner to serve along with rotis. Trust me this curry will definitely satisfy your tastebuds and goes awesome as side dish for rotis, you can also enjoy this vegan curry with rice as well. Both mushroom and sprouts works out wonderful in curry and if you dont like mushrooms you can replace it very well with potatoes or else mixed veggies.Somehow my choice will definitely go for mushrooms and obviously button mushrooms works wonder in this curry.Sending to Srivalli's Side dish Mela. If you dont know how to finish leftover egg whites after making a dessert or cake, am sure this gravy will definitely helps you to finish them as a fingerlicking dish.Actually after making a cake with eggs and egg yolks,i had some egg whites sitting in my fridge since a day. I planned to finish them in chocolate mousse but somehow i changed my mind and prepared this delicious tamarind gravy aka kuzhambu. 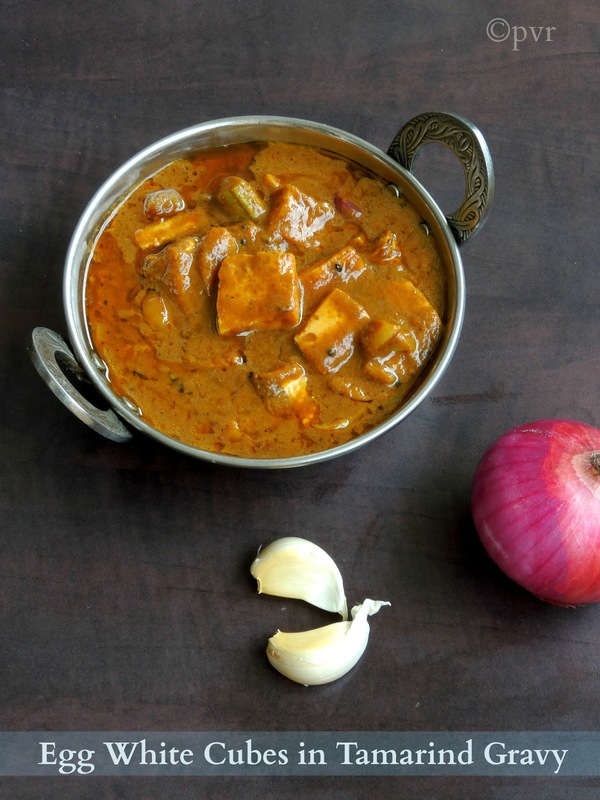 This tangy gravy tastes fantabulous with rice and papads, they suits even more delicious with South Indian breakfast dishes like idlies and dosas. Many peoples dont eat egg yolks but they love egg whites,some make egg drop like gravy or else hard boiled eggs gravy, for a change make this egg white cubes gravy am sure this will definitely tastes different and completely a new gravy from our usual kuzhambu.Needless to say tangy gravies tastes more delicious after a day, obviously this gravy also tastes fabulous the next day.Sending to Its Potluck LeftoverMagicOver Event. 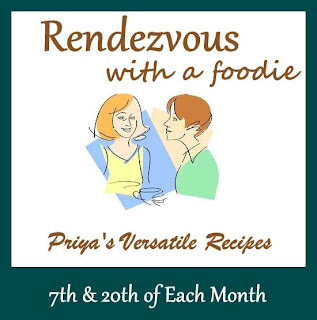 Coming to today's guest, She is none other than Preeti Tamilarasan of Indian Kitchen. 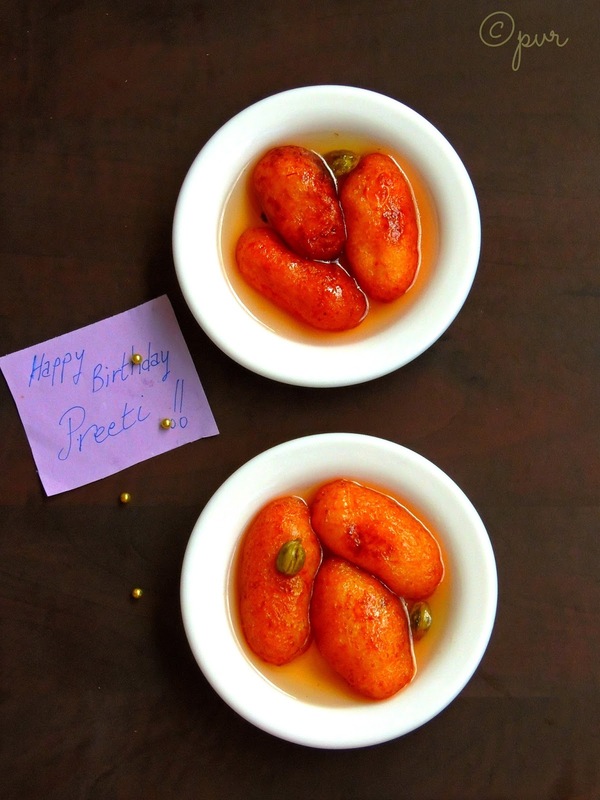 For me,Preeti means a brilliant photographer, excellent cook, innovative chef and a pure non vegetarian lover.If you go through her space, her breath taking pictures will definitely speaks a lot. Give her an ingredient, am sure she will give you back an incredible dish.Her creativity doesnt have any boundary and she makes me hungry everytime whenever i go to her space. Preeti is a humble,down to earth person,modest, and a young lady who always speaks from the bottom of her heart, if you have chitchat with her am sure you cant stop yourself pinging her atleast once a day.Recently she even joined her hands with few more blogger friends for making a virtual birthday for me, how lucky i am na.I have to say a big thanks to this virtual world for giving me a bunch of honest friends to whom i can share my laughs and sorrows, obviously Preeti is one among them. Trust me, am eagerly waiting to make a trip to India just to meet few of them.I came across Preeti's blog before a year and from that day onwards i got hooked to her space and i never failed to visit her space.Whenever i talk to Preeti, i feel like speaking to my younger sister who listens her elder sister,thanks Preeti for being this much kind towards me and seriously am loving our sister-friendship bond between us. I have know priya akka for past 1 year but never tried to talk to her. For past 5-6 months we have come close to each other and I really admire her cooking and baking skills. She is juvenile, down to earth and really hard working person. I have always told her to write a cooking book but every time she neglects it.. I hope she will write at least for us. When Priya akka came up with this idea, I included my name in the list but somehow could not complete the post in given date. Thanks akka for giving me time. Kheema or Qeema is basically prepared with minced meat along with peas or else with potatoes. Kheema can be prepare with any kind of meats, kheema can be used as stuffing in parathas,filling in samosas or in sandwich or as kebabs.When i chosed 'Meatless dishes' for this week's blogging marathon, i know i'll be making kheema with either soyachunks or cauliflower. Since i have already posted Soya Kheema Paratha, i skipped this time soyachunks and prepared this kheema with minced cauliflower. 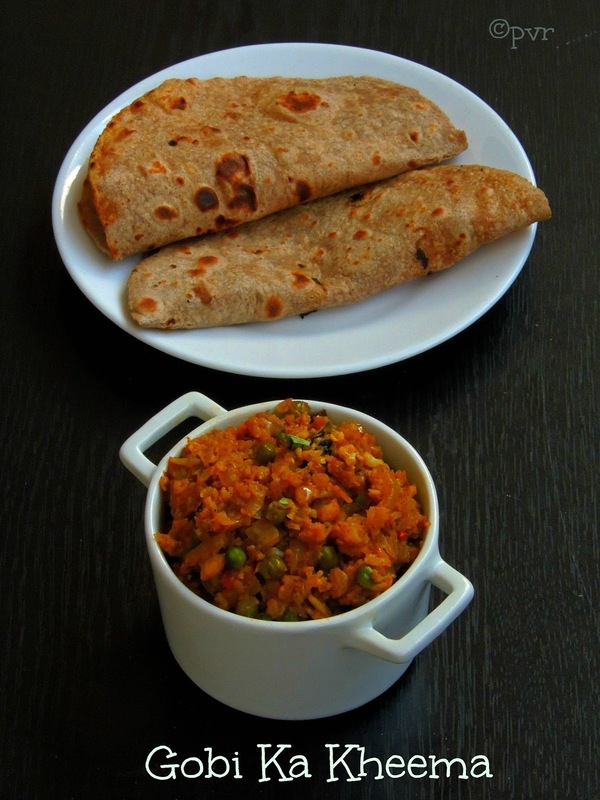 We loved this vegetarian kheema and its goes awesome as side dish for rotis. Obviously this kheema is completely vegan and healthy side dish you can serve very well to both vegetarians and non vegetarians.Personally i enjoyed thoroughly this minced cauliflower curry as a side for curd rice. If you are bored of minced soyachunks kheema, dont forget to give a try to this minced cauliflower curry.Sending to Srivalli's Side dish Mela. If you would have gone through my previous post, you might know very well that am running my third week of blogging marathon with a super duper interesting theme called 'Meatless dishes'. 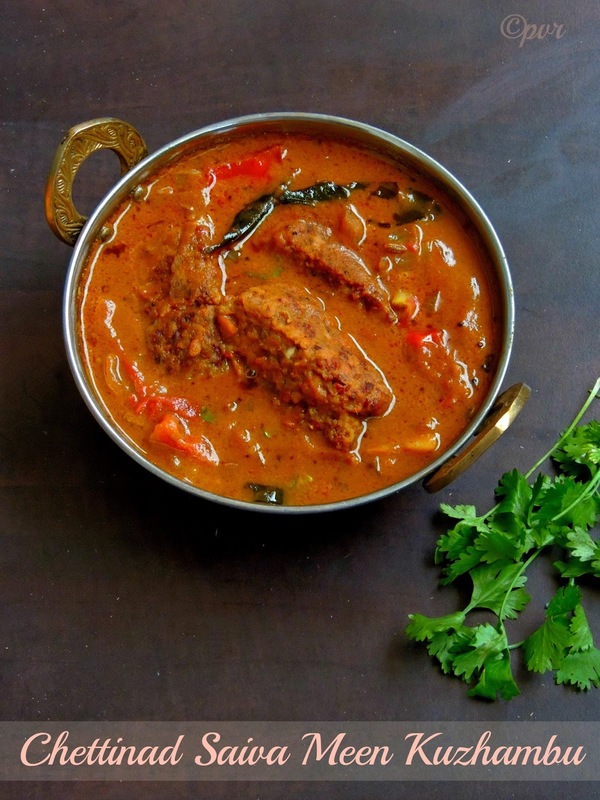 Coming to today's post, its going to be a Chettinad Special, this dish is well known in chettinad cuisine and this vegetarian fish gravy or curry goes for a legume based vegetarian fish. For making this vegetarian fish, we need some crotons plant leaf or banana leaf for steaming the legume mixture which is supposed to be the vegetarian fish.But here in Paris,its a hard task for me to get those both leaves,so i used a greased baking sheet for steaming which turned out the vegetarian fish prefectly as much as like those leaves. Actually this vegetarian fish gravy goes for soaked red chori/cowpeas aka thatta payir which is grinded as bit coarse paste with few spices.After going through a steam cook, this cooked red chori mixture will looks almost like steam cooked fish which is later sliced as fish slices. Then they are fried and added to a tamarind based gravy.This is how this vegetarian fish gravy is prepared, however the cooking process goes for bit time consuming, am sure this vegetarian fish gravy is definitely worth to try.A fingerlicking gravy tastes simply awesome and obviously you wont miss the fish here.Serve this gravy with rice topped with ghee and papads, am sure you will have a super filling lunch.Sending to Srivalli's Side Dish Mela..
Am running my third week of blogging marathon from today with an incredible theme ' meatless dishes', pick any non vegetarian dish and make it as vegetarian or vegan, sounds interesting and challenging na. Seriously I loved making meatless dishes with their vegetarian or vegan substitutes. You will be wondering how this tandoori tofu steak will tastes, trust me they are just wow. Even my younger one who dont like that much tofu enjoyed thoroughly his platter when i served him with some veggies for dinner. This dish tastes fantabulous even they are served as startes, a crowd pleaser definitely. 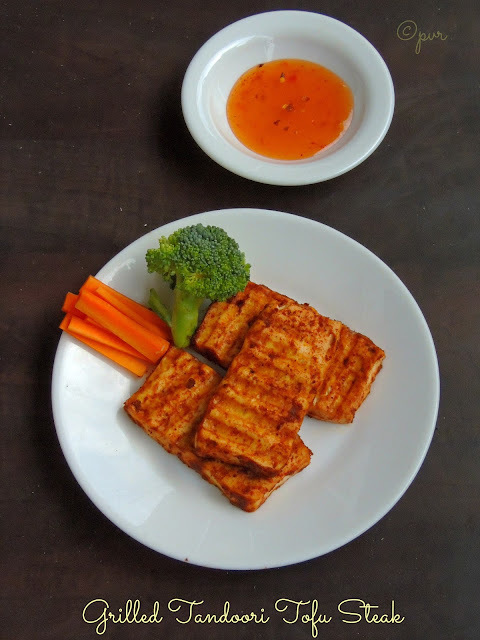 Having tofu in your fridge is a great thing, it wont spoil within few days like meat or fish, they are rich in protein, low in fat and obviously very cheaper too.Tofu marinated in tandoori paste, gives all the spiciness to the tasteless tofu. Personally i felt that this grilled tofu steak can replace very well the grilled meats and obviously meat lovers wont miss their meats.If you dont know how to feed your loved one with tofu, just give a try to this tofu steak and am sure they will definitely love this meatless steak.Check out the Blogging Marathon page for the other Blogging Marathoners doing BM#31.Sending to Pari's Only Food for Pregnancy. Almost all parts of drumstick tree have medicinal value, their leaves are high in iron content and have many medicinal properties. This drumstick pods are used as vegetable in making curries or soups and they are very popular in Indian food. Two days back, i bought some super fresh drumsticks from Indian groceries and couldnt stop myself making an interesting dish with it. My kids dont like having drumsticks in their dal or gravies, obviously i'll remove the pulp from the pods and mix them with rice. This time instead of adding drumsticks in dals, i tried my hands in making this interesting thokku aka masala with cooked drumstick pulp, trust me whoever dont like drumsticks will love this spicy,aromatic thokku with drumstick's pulp.You can serve this delicious thokku with rice, also as sides for rotis,pooris.Everyone at home enjoyed thoroughly this dish without any fuss and they couldnt even find the secret ingredient in this thokku, finally i revealed them and they were bit shocked. 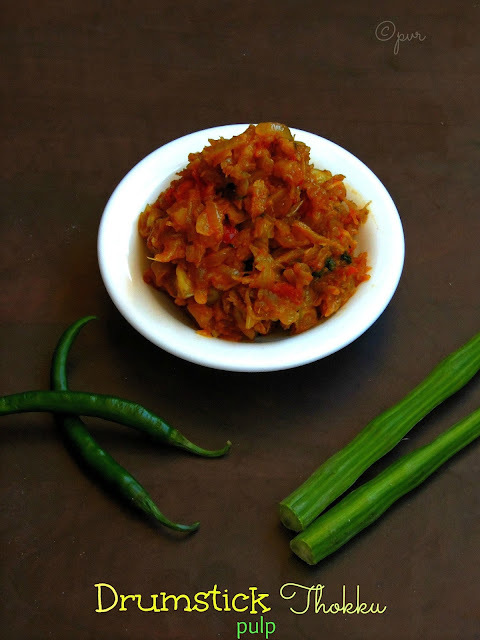 Seriously i'll recommand everyone to give a try to this drumstick pulp thokku atleast once and am sure it will definitely become your family favourite dish.Sending to Srivalli's Side Dish Mela.. If you get a chance to make a super old authentic aka traditional sweet from Hyderabadi cuisine, am sure you wont ever miss that opportunity to make them at home.When Srivalli announced this month's Indian Cooking Challenge, immediately i checked the link suggested by Mireille, i was shocked to see that this month's challenge was this Meethay Godhay from Zaiqa, a traditional sweet from Hyderbadi cuisine. When i checked through google to know more about this sweet,only Mona shares this sweet and its quite unique. Eventhough this sweets sounds unique, the method of making this sweet is super easy. This sweet goes for a simple dough which is rolled as a thin disc, then cut it as squares and make those squares as flower shaped pieces. Once done with the dough,let them dry for more than 6 hours or overnite. Once they gets well dried, those flower shaped doughs are deep fried. Finally cook those deep fried flowers in milk and sugar, later they are served at room temperature. Trust me, if you make this sweet, am sure you wont stop yourself with one serving. Thanks Srivalli and Mireille for suggesting this incredible sweet and Mona for sharing this traditional sweet she learned from her Mil..
One more interesting bread from my oven, you can call this bread as monkey bread or as pull apart bread. Somehow i prefer to call this bread as monkey bread as this bread looks like bubbles and tastes sweet,sticky as like gooey pastry. 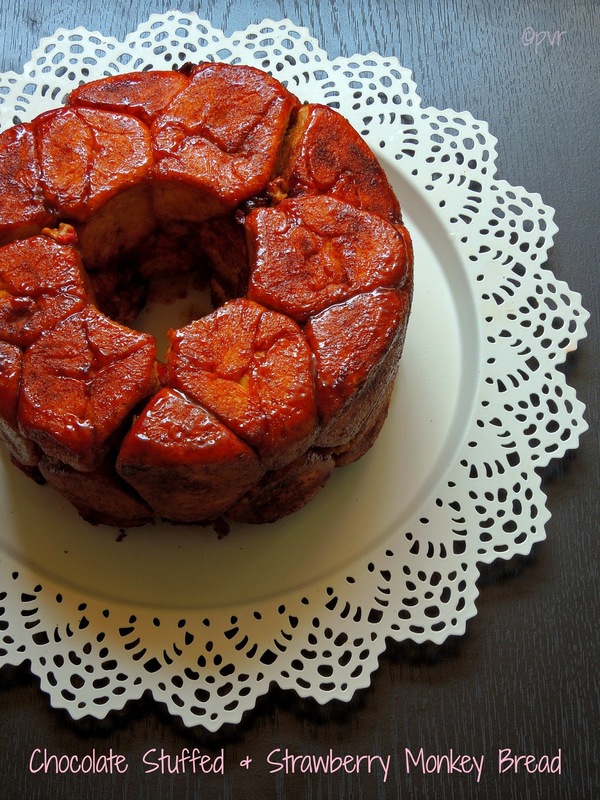 Monkey bread is made with pieces of bread dough pieces which is baked in cake pan been individually covered with melted butter,cinnamon,sugar and sometimes with chopped walnuts. This bread is traditionally served hot so that the baked pieces can be easily torn away with the fingers and eaten by hand. Coming to this chocolate stuffed strawberry monkey bread,this bread goes for chocolate chips and chopped strawberries, chopped strawberries sprinkled in between the chocolate chips stuffed bread dough pieces makes this bread simple flavourful and the cinnamon sugar along with cooked strawberry chunks gives an incredible aroma to this bread.One of my favourite smells in the world is freshly baked bread, trust me the aroma of this freshly baked strawberry monkey bread was mindblowing,its just out of the world. This is one more bread chosed and suggested by Manjula Bharath of Desi Fiesta for this month's Home Baker's Challenge.Thanks Manju and i loved your choice of bread for this month's challenge. Tangzhong or roux method give a soft bread,the texture of the bread coz of the water roux aka tangzhong makes cotton like bread and stays prefect for more than 2 days in room temperature. 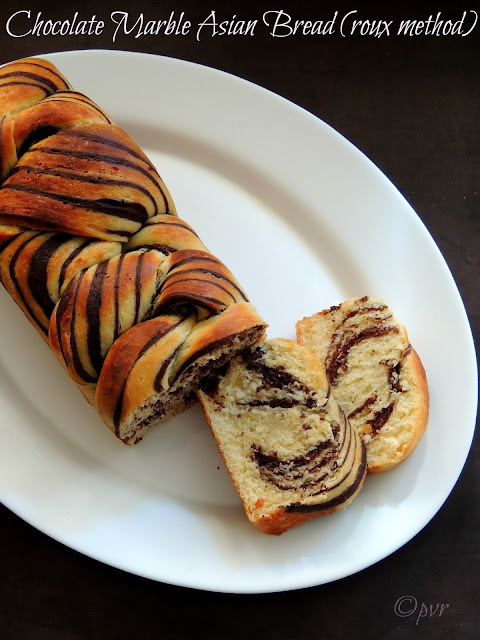 But am sure that this bread gets vanished very quickly coz of the presence of chocolate in it.To make the “tangzhong” or “water roux,” a mixture of water and bread flour is heated and stirred just until it forms a paste. Then, this paste is removed from the heat and allowed to cool, and added to the dough ingredients. When the water and flour first combine, the flour absorbs the liquid. Once heat is applied, the flour particles swell many times their original size and burst, releasing starch into the liquid. At that point, the mixture will turn like gel.This gel like flour paste can then be used as a dough enhancer to improve the moisture and texture in the final bread loaf.Breads prepared by this roux method doesn’t get stale and hard like other breads within a day of baking, it will stays soft and fluffy for several days. Coming to this marble Asian bread, Manjula of Desi Fiesta chosed this chocolate marble bread for this month's Home Baker's Challenge as the challenge of this month are breads.This eggless chocolate marble Asian bread goes for easy preparation and they can be done easily through bread machine or manually. 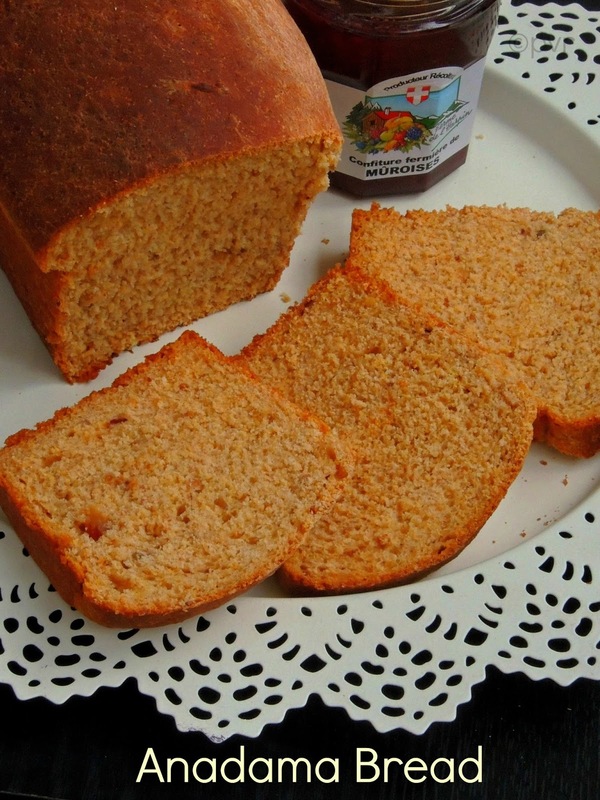 This bread with mild sweetness suits prefect for breakfast or for snacks. 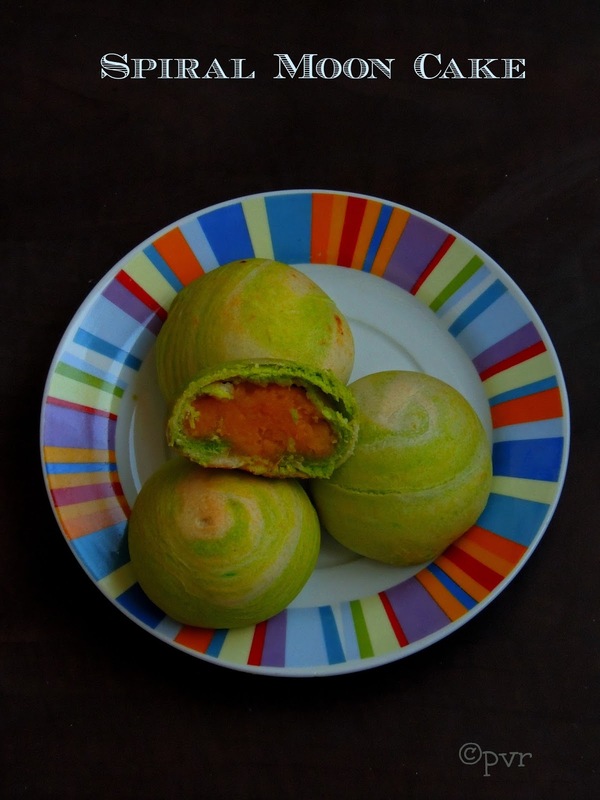 Enjoy this softy bread with your cup of tea or coffee for your breakfast and am sure you will have a filling breakfast.Sending to Bake fest hosted by Manjula,event by Vardhini. Anadama bread is a traditional yeast bread of New England in the United states made usually with wheat flour,cornmeal,molasses and sometimes with rye flour. This bread was in my to do list since a long and finally i got an opportunity to make some as Manjula Bharath of Desi Fiesta chosed this bread for this month's Home Baker's Challenge, yep this month was bread baking. Manjula pulled me to make this anadama bread and trust me i was super happy that this bread came out extremely prefect. This bread goes for molasses, since none at home like molasses also molasses is quite expensive here, i skipped its completely and used homemade dates puree to replace the molasses. Dates puree in this bread makes this bread seriously very much healthier and the sweetness from the dates puree is quite enough to make a mild sweet Anadama bread. The bread recipe Manjula shared goes for all purpose flour completely which i halved with wheat flour and all purpose flour. If you are trying to make with wheat flour, trust me your bread will be very much dense. Better to halve the all purpose flour with wheat flour.Thanks Manjula, we loved this bread and we couldnt stop having them for our breakfast with nutella and fruit jam. Dates Puree: Take a cup of chopped dates with half a cup of water and cook in low medium flame,(add water if needed), cook in simmer until the dates gets well cooked. Put off the stove and grind as thick paste, your dates puree is ready.Sending to Bake fest hosted by Manjula,event by Vardhini. 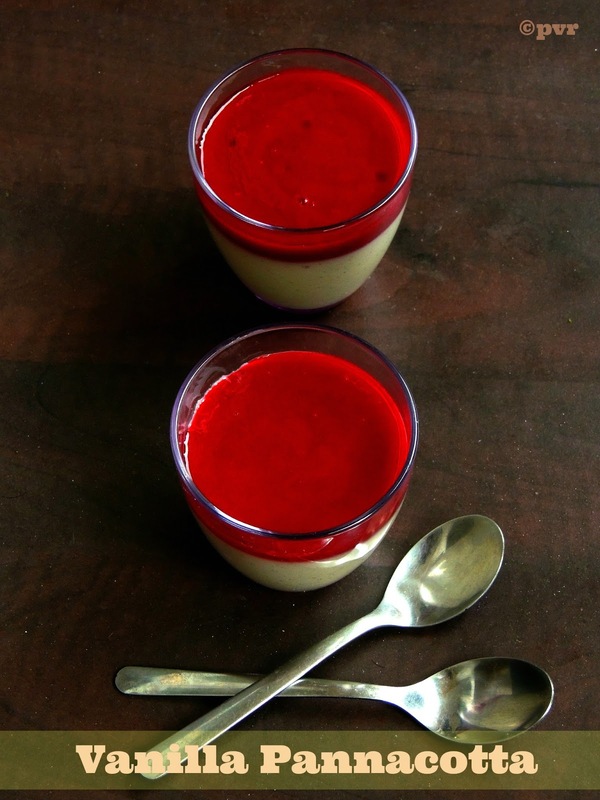 Pannacotta is a famous Italian dessert prepared with cream,milk,sugar and along with gelatin or agar agar (a vegetarian gelling agent). This Italian dessert tastes fantabulous when the weather is too hot as they are usually served chilled.Coming to today's post for this week's blogging marathon,since my theme is mini servings, i chosed to share a classic pannacotta prepared with Madagascar vanilla pods which i recently got through a friend who came back from Madagascar island. Obviously vanilla panna cotta using Madagascar vanilla pods seriously makes a huge difference, tastewise they are just unbeatable and absolutely delicious. Vanilla pannacotta served with berry sauce, an absolute delightful dessert to enjoy thoroughly after a super heavy lunch or dinner. Traditionally pannacotta is flavoured by vanilla,but later peoples started making pannacotta with different fruits and chocolates,even i love chocolate pannacotta very much..For a light version of this pannacotta, you can use low fat milk and low fat cream,which tastes truly delicious too.Check out the Blogging Marathon page for the other Blogging Marathoners doing BM#31. Sending to Srivalli's Summer Special Mela. As i told earlier, August is a month of celebration for me.. I just finished my birthday two days back and one of my friend, a food blogger,a humble human and a down to earth person is celebrating her birthday today. She is well known for her photography skills, many beautiful creative dishes and very much for her droolworthy non vegetarian dishes. She is none other than PT aka Preeti who blogs at Indian Kitchen, i crossed Preeti last year through this immense blogging world and immediately i started fallen in love with her space. I never thought that a day we both will get closer, thank god it happened and now Preeti is one of my best and close buddy aka sister.She call me Akka with loads of love, i always stunned by her humble attitude and the way she blogs constantly, do you know she blogged almost 600+ posts within a year. Am thanking everyday this virtual world for giving me this much sweet,lovable sisters.We chosed sweets and savouries for Preeti's virtual birthday party and i chosed immediately one of her recent post Aloo Jamun aka potato jamun eventhough i have a bunch of bookmarked dishes to do from her space. Happy birthday Preeti sis,may your birthday bring a smile to your face,happiness to your heart and many blessings to your life, may your big day be as special as your are special to me. Have a magical birthday and be happy everyday sis..
Trust me these aloo jamuns are seriously mindblowing, succulent, juicy and dangerously addictive. They are quite easy to prepare with less ingredients,am sure if you make this potato jamun at home you wont ever run behind the store bought jamun mix. Never thought that mashed potatoes makes a wonderful spongy juicy jamuns. Am starting my second week of blogging marathon from today with a cute theme, yes the theme of this week is Mini servings. During the three days of blogging marathon,i'll be posting dishes served as single,individual or mini servings. For the today's post, am sharing here the famous Italian dessert Tiramisu as parfait, instead of making in huge quantity i served them as individual serving to everyone at home. An incredible dessert to relish after a heavy lunch, this parfait will be very refreshing and delicious. Since this dessert is completely egg free, you can enjoy this tiramisu parfait without any guilt. Also i used speculoos biscuits instead of usual ladies finger, this speculoos biscuits with eggfree mascaprone cheese tastes fantabulous. 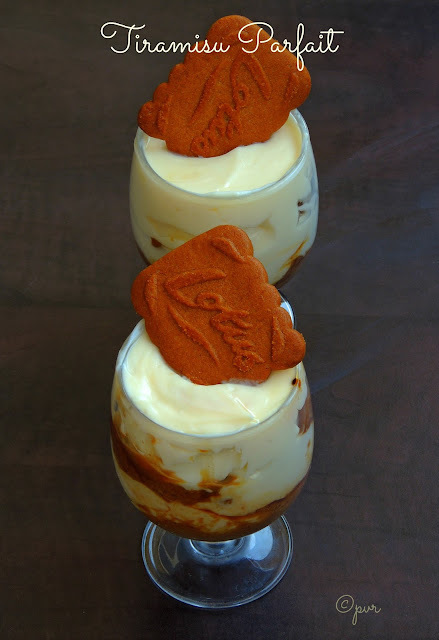 If you make this parfait at home, am sure that you make this elegant dessert quite often as this dessert need very less preparation.If you dont have speculoos biscuits,you can make very well with ladies finger too. I used store bought speculoos for making this dessert which makes the life easier.Check out the Blogging Marathon page for the other Blogging Marathoners doing BM#31.Sending to Srivalli's Summer Special Mela. You might have cooked parathas with ragi or either with tofu,but have you ever combined these both nutritious ingredients together in parathas? if not you should definitely give a try to this health,nutritious,super softy parathas definitely.Dunno whether i can say that i prepared this ragi tofu paratha accidentally or intentionally, actually i prepared this paratha during weekend. After a simple tofu pulao for lunch, there were some leftover tofu which i finished adding it in usual ragi paratha. 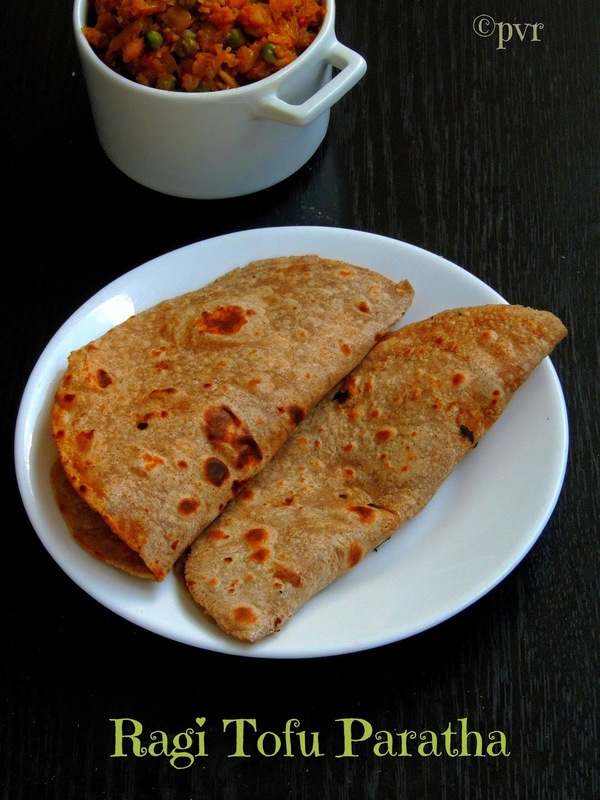 Trust me, this ragi tofu paratha turned out extremely super soft,we enjoyed thoroughly this healthy paratha for our dinner with a cauliflower curry. Needless to say how healthy both ragi and tofu are, adding these both ingredients in parathas is definitely a best way to sneak this nutritious ragi and soya cheese aka tofu. I know how kids dislikes tofu, i had loads of experience in it. Dont forget to feed them atleast once a week, i love to feed my kids tofu by adding them tofu quite often in parathas.Sending to my own event Healthy Diet - Healthy Lunch Box guest hosted by Sowmya and to Pari's Only Food for Pregnancy. I cant imagine serving salads or soups without dinner rolls or french baguettes,dunno why we still stick with breads. Obviously if i dont want to get or forget to get baguettes from the nearby bakery, i'll get ready for making homemade dinner rolls. Few weeks back, we have invited few friends for a simple dinner at home and since they are from Tunisia, they love our Indian foods very much that too spicy. I prepared our family favourite and the famous Pav bhaji for them along with these soft dinner rolls aka Laadi pav to serve with. 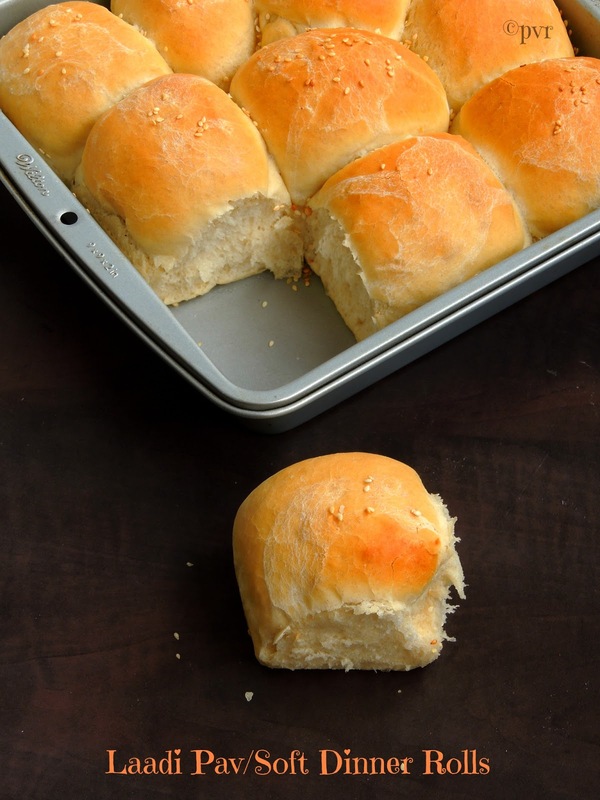 Everyone enjoyed thoroughly and i got many appreciation especially for this eggless super soft dinner rolls. Watelse a food blogger need na! even my better half was very much proud about this dinner as its seems that those friends talked for a long about their first Indian dinner.These laadi pav suits prefectly to enjoy with bhaji,you can make vada pav very well with this pav or simply serve them as side with stir fries, however we loved having this pav even for our breakfast with butter and jam.Sending to Bake fest hosted by Manjula,event by Vardhini. You guys know that every month i'll be introducing a budding blogger and it happens twice a month, honestly i have to say a big thanks to my guests for making this event a big hit. Thank god even in this virtual world,am blessed to have a good bunch of friends who are really close to my heart. If you are food blogger and your blog is just less than 2years old, dont forget to ping me for joining in this event. I'll be happy to showcase your blog in my space without any hesitation.Today am introducing one of my best buddy since my earlier age of blogging, our friendship is growing day by day and eventhough we are far away, we have shared many pleasant moments together both virtually and personally. Manchurian doesnt need any introduction, this Indo chinese foods are prepared usually with a vegetable or a meat. Marinated meat or veggies deep fried then sauteed with onions, bellpeppers along with a mixture of sauces makes this wonderful appetizier or side dish. Manchurians goes awesome with fried rice or else with a bowl of hot piping rasam rice. 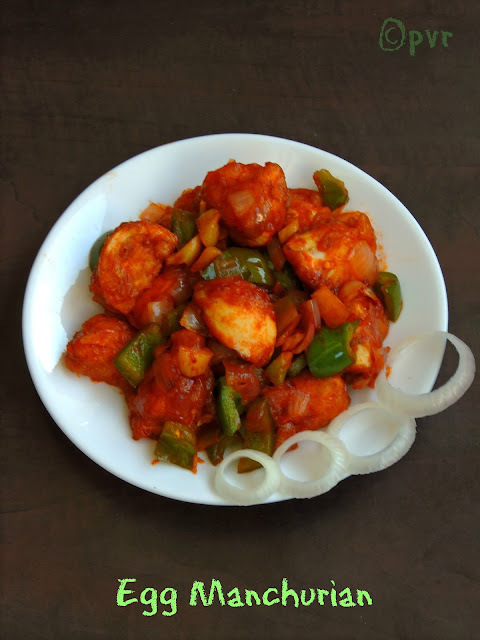 Recently i tried making this egg manchurian with hard boiled eggs and they came out extremely delicious.If you dont like egg yolks, you can remove it very well and make this manchurian just with cooked egg whites. You can serve this egg manchurian also along with Indian style one pot meal. A prefect crowd pleaser too, make some and am sure you will definitely love this manchurian.Sending to Srivalli's Side Dish Mela..
After two beautiful dishes cooked through microwave oven, i seriously want to finish this week's blogging marathon with a sweet or cake cooked through it. Microwave oven do bake cakes within few minutes and if you are craving for a quick bake,just make a single serving mug cake through microwave oven,am sure that this mug cake will definitely satisfy your sweet tooth. Since am a chocoholic person,i love anything with chocolate and this kind of sudden mug cakes are my all time favourite. 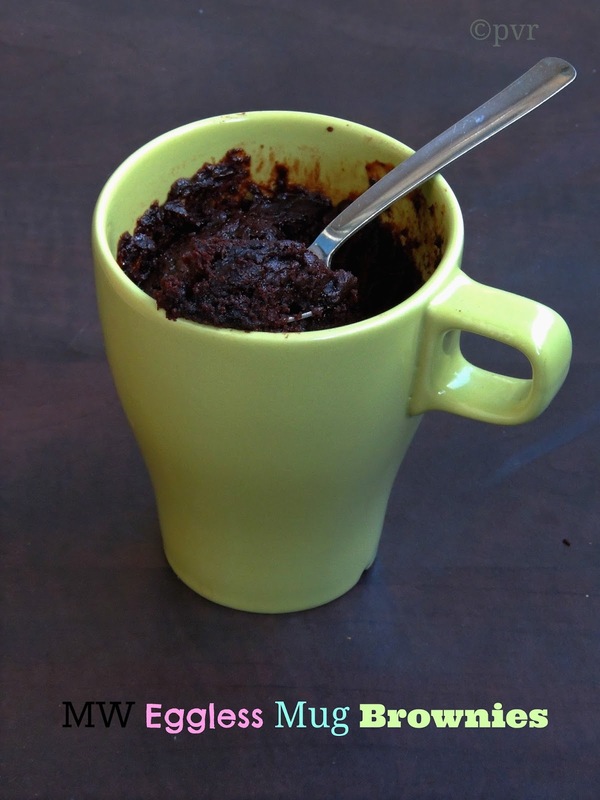 Eggless or butterless with chocolate or without chocolate, this mug cake gets ready within a minute. For my today's post of blogging marathon under the theme Microwave cooking, am sharing this super moist, highly chocolatey,butterless and eggless single serving brownie. Just mix all the ingredients in a mug and cook in microwave oven for a minute, thats it your brownie is ready to enjoy either with a scoop of icecream or chocolate syrup.Such a quick brownie na, if you make this brownie am sure you will be making this single serving brownie quite often.Check out the Blogging Marathon page for the other Blogging Marathoners doing BM#31. My second post for this week's blogging marathon is this Microwave Podi Idli coz my theme for this week is Microwave cooking. Podi idli doesnt need any introduction and South Indians love these tiny steamed rice cakes tossed with spice powder.Mini idlis are my kids favourite dinner, most of the time i'll serve them simply with sambar but they do love mini idlis as podi idlis.Recently i started experimenting with red rice and prepared red rice idly batter few days back. Obviously i tried this microwave mini idlies with MW idli plate which i bought during my last trip to India.These mini idli plates are seriously very handy and makes ur life easier if you feel like having these tiny idlies.Within a minute, these microwave mini idlies will gets ready and the podi idli preparation take almost less than 2-3minutes. This podi idli takes altogether just 4 minutes to get ready, yes very much less time than the stove top one na..Instead of using usual idly podi, i used Flaxseeds Paruppu Podi for making this microwave version of podi idli.Check out the Blogging Marathon page for the other Blogging Marathoners doing BM#31.Sending to my own event Healthy Diet - Cooking with Wholegrains..
August is going to a month of celebration for us, this month is so special for me coz am a august born too. Many of my friends who are very close to my heart celebrates their birthday in august too. One of my food blogger celebrates her birthday today,since i want to celebrate her birthday virtually i cooked an appetizier from her space as we, a group for food bloggers chosed to cook some food for the celebration under the theme potluck party from her space.. Happy birthday Sangeetha Priya of Nitha's Kitchen.. Happy birthday to you..May this year bring something new and exciting for you, may this birthday turn out to be as amazing as you..Happy birthday to you again. Chinese foods are my weakness especially their spring rolls are our family favourite. I can get chinese foods easily as am living in Chinatown and atleast thrice a month i make chinese foods at home.I have made zillions of time these spring rolls at home but i wonder how i forget to post it in my space,its happens na.Doesnt matter,now i had a chance to post it as i picked it from Sangeetha's Space.Spring rolls are usually served for starter here in every chinese restaurants. They can be made very easily and the filling will also go for an easy breezy preparation. Sauteed veggies rolled in a spring roll sheets,once fried in oil makes these crispy beauties.Also am running again the first week of blogging marathon from today and my theme for this week is Microwave cooking, earlier i used my microwave oven just for reheating but after entering to this blogsphere i started experimenting with it and i can cook a feast now with it. Few days back i made these crispy spring rolls and served with microwave Thai peanut sauce for our snacks.This crispy spring rolls dipped in peanut sauce makes an excellent pair.This microwave peanut sauce goes for an easy breezy preparation and they gets ready within less than 2minutes. 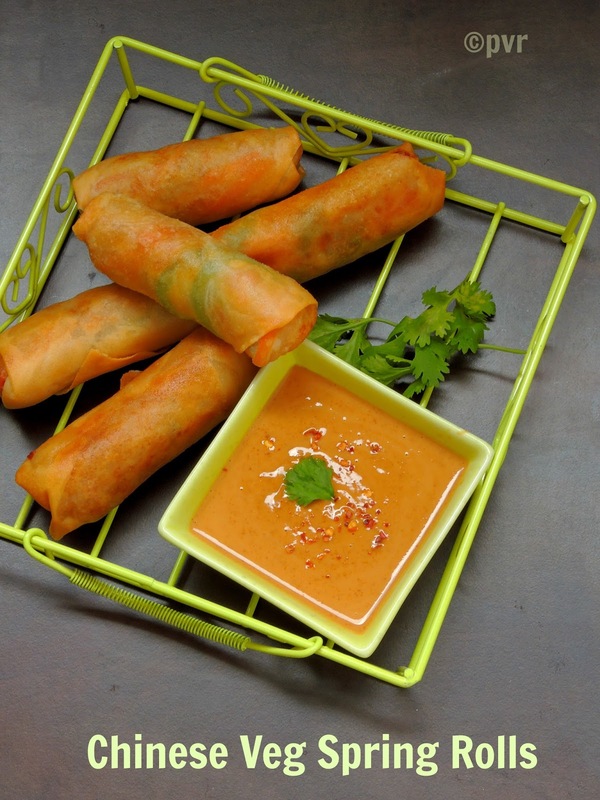 Smooth peanut butter cooked with soya sauce,rice vinegar and minced garlic makes a wonderful dip for spring rolls.Check out the Blogging Marathon page for the other Blogging Marathoners doing BM#31. Everyone will agree with me if i say nothing can beat the aroma of freshly baked breads at home. I love baking very much, i can even say i talk baking,eat baking,live baking, just like the famous actor Rajini's dialogue. Its really hard for me to keep away from baking and if i feel down immediately i'll go for baking. Obviously the bread kneading or whisking makes me happy and keeps me away from my stress. 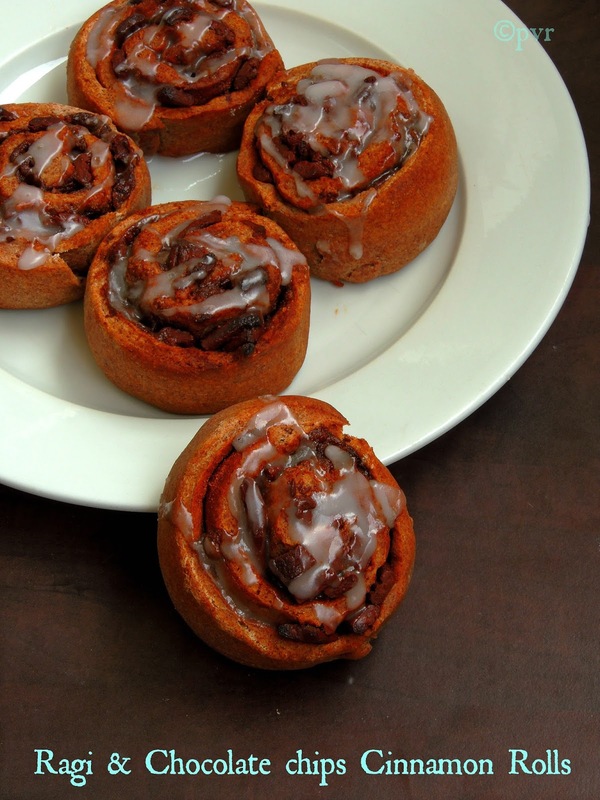 Cinnamon rolls are one of our family favourite, and i'll try on making this beautiful rolls as healthy version with whole grains, after Whole wheat cinnamon rolls here comes one more interesting rolls with ragi flour. After many fails, finally i got the prefect measurement myself and fixed it for making these beautiful ragi cinnamon rolls.If am trying anything new in baking, obviously i'll add chocolate chips,so that i can feed easily to my kids. Needless to say that these rolls turned out prefectly and since there were chocolate chips in it, my kids doesnt hesitate a second to enjoy these healthy version of cinnamon rolls. Initially i was bit anxious about this cinnamon rolls with ragi but trust me they are simple awesome, you can enjoy these cuties without any guilt eventhough the colour will be bit dull than the usual one. Anything from freezer makes everyone happy when the weather is super hot outside, as i told earlier we are running behind chilled fresh juices, icecreams coz of the super hot weather and am trying to avoid to buy from stores, nothing can beat the homemades na. Today is the 1st day of the month and obviously i'll posting my first recipe of the month for the famous South vs North Challenge an event owned by Divya Pramil. After making an elaborated Rajasthani Thali challenged by Manjula, i was quite excited also anxious to know about this month's challenge for the Southern team, coz anything can happen in this SN Challenge. Thank god, this month's challenge was the famous Kesar pista kulfi, a very apt chilled dessert for us to enjoy while the North team have to prepare the most famous dal kheer aka pasiparuppu payasam challenged by Divya Pramil. 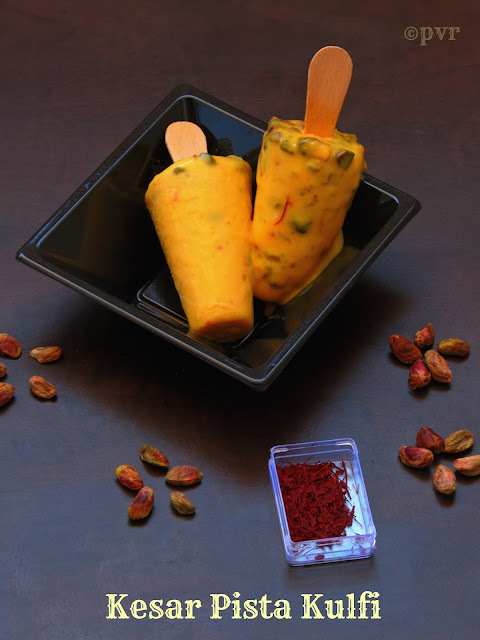 Once i went through the Kesar Pista Kulfi recipe challenged by Shruti of Shruthi Rasoi, i started immediately making this incredible nutty kulfi for our afternoon's dessert. Thanks Shruti,am just relishing the kulfi dear and loving it, its was so creamy,highly nutty with a superb saffron flavour. The motto of this event is to exchange an Indian recipe between two teams. One team is Southern team (bloggers born and brought in South India) and the another one team is Northern team (food bloggers born and brought in North India). Every first of a month, a blogger from each team will challenge a recipe from their origin and the opposite team have to cook the recipe challenged by the other team. If you want to be a part of this challenge, dont forget to join us, just send a mail to the Divya and get ready to face the challenge every month.Sending to Srivalli's Summer Special Mela. Its been a year, i prepared vathals aka fryums at home, this time i dont want to miss the opportunity to make some homemade fryums since the weather in Paris is super hot since few days.Instead of making usual rice based fryums, i tried my hands in making a healthy version of fryums with ragi aka finger millet and sago. In fact i never tried this, but somehow i want to give a try to this combo, and tried with small quantity of sago and ragi. Trust me, these fryums turned out extremely tremendous and prefect as like the usual sago fryums. 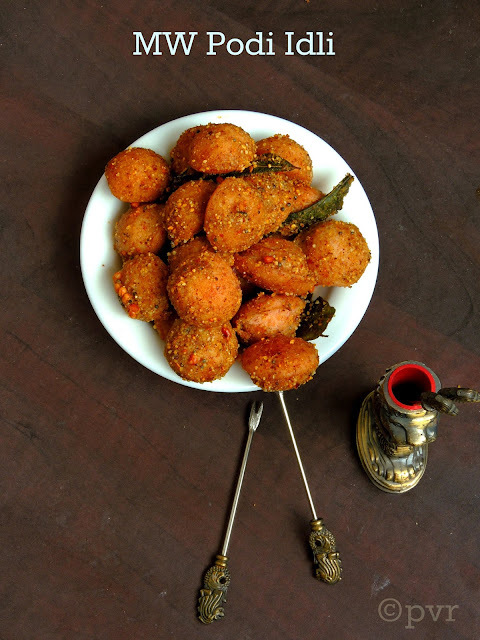 These fried fryums looks cute with a different colour, everyone at home loved munching them, they tastes even more delicious when served along with some hot piping sambhar rice. 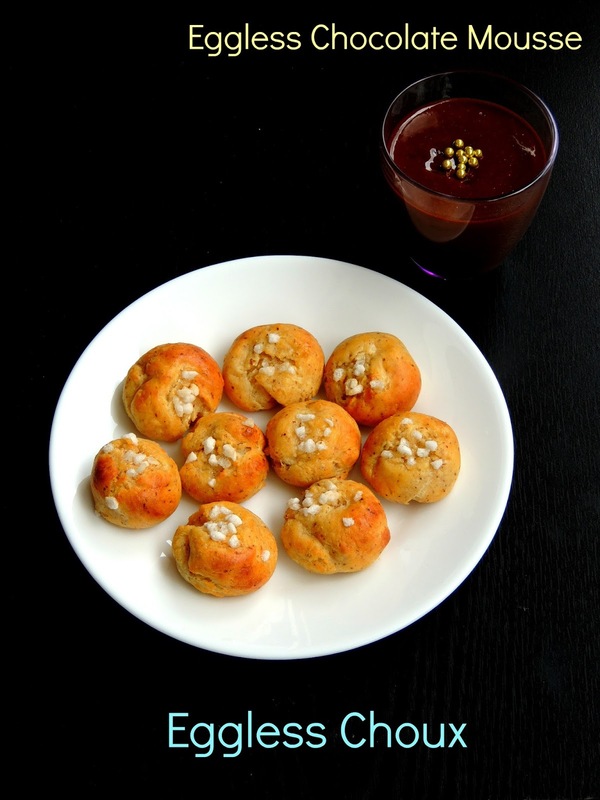 Next time while making your fryums dont forget to give a try to this ragi sago fryums, am sure you guys will love it.